I believe in being different. It’s not that I’m against traditional concepts, it’s just that most of them haven’t worked that well for my golf game. This is a risky post to write (that’s why I’m writing it) because I could come across as a renegade and golf basher. But that’s not my intention. We can get so engrossed in our way of doing things, that sometimes we’re blind to a different option. And potentially that different way is a better way. I fumbled around for years with my golf game until I realised that the talent was already inside me – that I didn’t need to keep searching for better technique. Hopefully this opens your eyes to new possibilities. I get strange looks from golfers when I tell them what I do. Most are attracted to the golf swing model I helped develop – but when I tell them that the golf swing is only a part of the puzzle it seems I have two heads. But I don’t back down. Not for anyone. I explain my case as best I can and move on. People often think I’m being different just to be difficult. It’s not the case. For me it’s about finding greater enjoyment and satisfaction – something traditional instruction and mindset didn’t give me. So I thought I’d put a list of things that I do that challenges the norm. 1. Don’t think about technique. This always causes a few comments. I can honestly say that I’m not concerned about my swing or technique when I play. I think about where I want the ball to go, but I’m not fussed with how it gets there. This has been liberating and fun at the same time. It has also been the reason why the last few years have been the best of my career. 2. I don’t practice. Sure, I’ve hit a lot of balls in my time and it hasn’t hurt me. But I no longer spend time doing what most would consider regular practice. I get my practice when I’m playing golf. Playing golf is the best practice of all. I need to add that I spend a few minutes each week chipping balls in the backyard (with Almost Golf Balls). But this is fun time where I’m exploring and challenging myself (like trying to hit the clothes line four times in a row). 3. Don’t change clubs very often. I haven’t really bought into the technology thing. Sure, I have a titanium driver with a graphite shaft, but I don’t rush out and buy new clubs each year. My irons were bought in 2000 (they’re antiques) and I’ve had the same driver and putter for years now. 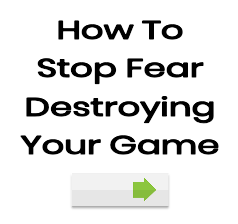 Many of us get distracted by technology – I don’t think it helps that much if you’re not able to play without fear. 4. Stopped having lessons. I should point out I mean traditional golf lessons. I have regular coaching sessions with Scott Barrow (he pushes and challenges me really hard) but I don’t do normal lessons. To be honest I got bored with them. It was tiring always working on something and never being able to get there. I once spent over 18 months working on my set-up. After my frustration reached boiling point the coach said the changes wouldn’t help that much anyway. I didn’t go back after that. 5. Don’t try and hit the ball straight. Sometimes it goes straight (when I miss hit it) but I’ve played my best golf when I fade my driver and hook my irons. This doesn’t make much sense I know, but what does? When I started playing the shots that felt comfortable to me this is what I came up with. When I stand on the tee and am able to hit a fade it feels great. The same when I can draw in an iron shot. Sometimes the hole shape goes against me and I have to improvise but this is what makes the game challenging. 6. Play golf. “Play” or “playing” is what a kids do in the park. It the same with a cat and a ball of string. I try and approach golf in the same way. If I can become absorbed in the art of hitting the ball and playing the game then I’ve had a good day. Most of us take the game far too seriously to play. Many have long forgotten that golf is a game. 7. Score not important. I’m still working on this one. I love to shoot good scores but I’m realising that score is not the most important thing. Turning up, playing the game and learning something gives me more meaning. The paradox is that when I forget about the score I usually end up with a result I’m pleased with. Grayden, regular reader and contributor, is embarking on this mission too. There are probably more but this is a good start. Hopefully they stir your thoughts and open up more discussion. Leave your thoughts below. Sounds good to me! One of my favourite sayings is “if you want what everyone else has, do what everyone else does”. And what does the average golfer “have”? Basically frustration, anxiety and disappointment punctuated by the occasional burst of exhilaration. And this is how they play ALL THEIR LIVES. Look at all the middle aged blokes out there week after week – still as bent out of shape as they were 30 years ago! If you want something better than what they have you need to have the courage to approach things differently to the way they do. I totally agree with everything you have had to say here because when I was trying to tell my mate what my (auto) journey entailed he really did not understand and kept referring back to technique driven philosphy and I thought your not one bit interested in what I am doing more trying to shove his philosphy down my throat so this post will finally give me the strength to tell him to shove it because I am no longer interested. Cam – I think the last one on your list is the most important. Ask yourself this: if the human brain was incapable of adding up numbers would we still enjoy golf? I’m pretty sure we would all answer with a resounding YES! We need to then ask “Why?” The answer to that question is pretty much the answer to all of it. Agree. While not worrying about the score is difficult, it might just be the path to pure golfing enjoyment. My first golf biz was called, “Golf Your Way”. You really have to have the guts to do what you want. You can’t worry about what you think other people are thinking about you. Most people are more concerned about their own game anyway. Thanks Grayden. This mindset is true of all things we do. It’s tempting at times to be a sheep and follow. But when we start leading some interesting things can happen. Just got home after hitting a few on the field. Didn’t get off to a great start, and found myself going back to “trying” a few of my former swing styles(have tried many swing theories in the past, or should I say swing formulas). None of those ‘potions’ offered any further success. They never seem to last. Just a healthy reminder to not rely on any potions or elixirs. And a reminder to stop attaching negative emotions to facts or feedback. An errent shot is nothing more than feedback, afterall. Another day, another lesson learnt(or learned). Then got bogged on my way from the field. Great to see the return of the banter.